The Conference Committee together with the National Team of Cardijn Community India will be meeting at Joe Beach, Mamallapuram, Kancheepuram district on the 14th and 15th August according to communications issued by Jomon Cherussery, the Conference Committee Chairperson and Xavier Antony, CC India National President. Members of the Finance Commission and Extension Team will also attend this meeting as invitees. This larger meeting will be the final one before the CCI International Conference in December at Joe Beach. In view of the financial constraints the members are meeting their own travel to Chennai (and Joe Beach) besides sharing the cost of accommodation and food expenses. They are coming from far away places like Jamshedpur, Pune, Nagpur, Kanniyakumari, Trichur in Kerala and Bangalore. The meeting will finalise most of the aspects of the preparations based on the decisions made at the last meeting held in January this year in Chennai. All the Conference Committee members and the National Team members are busy with the responsibilities entrusted to them and they are expected to give final touches to the plans made for the conference. Dr Paul Sinnappan (Malaysia), Conference Convenor will be coming to India to meet the leaders of CC India and to discuss with them many aspects of the conference. He will be attending the preparatory meeting at Joe Beach. He will also be meeting the Secretary General M. J. Ruben who is assisting CC India in the preparations. Welcome Paul. We look forward to your visit. 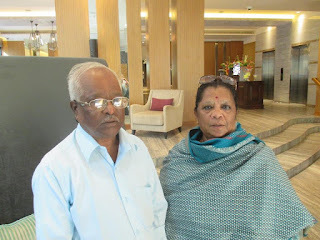 Ms Philomena Doherty, a former YCW from Chennai who is married to YCW Australian Extension Worker Bernie Doherty and settled in Australia was on a visit to India recently when she met Little Joe (Joseph Arokiasamy) of Cardijn Community India. 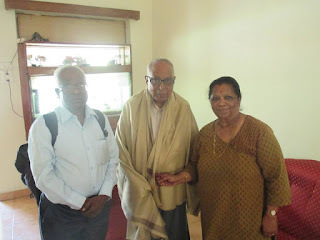 Father Thomas Joseph, worker chaplain for over 50 years was the Diocesan Chaplain when Philo was a member of the YCW, Pudupet Section in Chennai. Ms Doherty along with Little Joe met Father Thomas Joseph at the Sacred Heart Seminary, Poonamallee and reminisced the YCW days in India. came all the way from Pune to meet Ms Philomena. Father Thomas Joseph is 96 years old. He is the Spiritual Father at the Sacred Heart Seminary near Chennai and is still active. He has recently written and published a book on 'Work and Worker'. 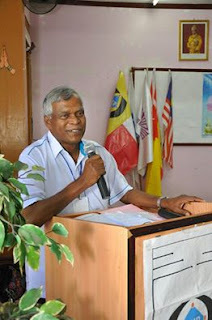 Father Thomas Joseph will be attending the CCI International Conference in December this year at Joe Beach near Chennai.